My husband and I live in the desert of Southern California. In August of 2006 my husband was getting ready to leave and noticed a cat under his truck. The temperature was over 110 degrees that day so he knew the cat must be dehydrated. We also knew someone had abandoned the cat, since we have seen many instances of this cruelty since living here. As soon as the kitty saw my husband, he immediately came out from under his truck and began rubbing up against his legs, begging for affection. We tried giving him water, but he wouldn't drink. We knew he was in a bad way. We tried some tuna and he wouldn't eat it. Next we tried milk, and he inhaled it, as we breathed a sigh of relief. Then we tried the water again, and he finally drank, then the tuna, and he gobbled it up. 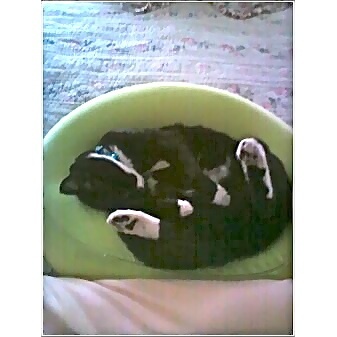 Naturally we adopted him, and within a few days of coming home from the vet and being neutered and getting all his shots, we named him our little "Booger," very appropriately, which we later nicknamed "Boogie." Boogie loves to play, be around everybody, and gets into all kinds of mischief. When we began grooming him, which he loves, we noticed he has white splotches on his underside in exactly the same pattern as if he was wearing a bikini. He is always embarrased when we show people his bikini! 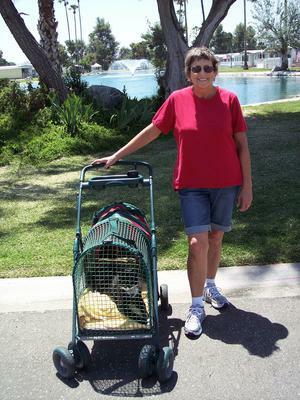 Boogie loves to go for walks in his stroller, and is now the hit of our retirement community! 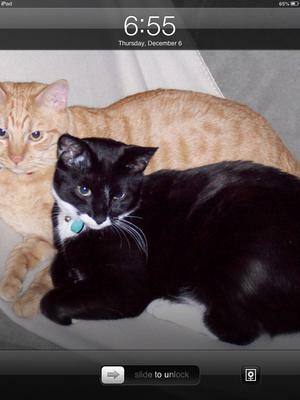 We added a companion, "Tigger," who was Boogie's best friend for a few years, until we lost our ""Tigg-Tigg." Boogie misses him dearly. About a year afterwards Boogie developed a condition called "stomatitus" which is an immune system disorder characterized by a bacterial infection in his mouth in which we have to give him daily antibiotics, and regular oral hygiene, which he hates. Because of the stomatitus we can't adopt another cat as it is probably contagious. Also, stress causes the condition to worsen so we can't travel with him. We love our little Boogie" very much as he is the most affectionate and loving cat we've ever had and know he was a gift from Heaven. It's so hard when you lose a pet you love so much. Focusing on the good memories helps a lot. I'm glad that a new cat is bringing joy to your home. Just wanted to let you know that our sweet Boogie went back to Heaven in January of this year. His condition he had called stomatitis took a real turn for the worse right after the holidays. We tried doubling up on the antibiotics and read about a treatment called collodial silver spray that worked for some cats with the same condition. We tried it on our Boogie with no results. In the end he was just in so much pain that it even hurt him to swallow, and the treatment was just something else that made his suffering even worse. My husband and I finally decided that the most humane thing to do was to send him back to Heaven. We have been devastated, and have cried enough tears for a lifetime, but we know it was the right thing to do. Our home felt so empty without a cat that after 3 weeks of loneliness, we adopted a 4 month old male Siamese mix who we named Jonesy. Our house is beginning to feel more like a home again, but we will always have a very, very special place in our hearts for our sweet Boogie. What a wonderful story!.. Hard to believe people dump these beautiful babies or any animal for that matter! We took in our hungry stray Tuxedo cat last summer and he so wonderful and very loved! A gift from God! I love that you can walk him in the stroller. God bless you! Sweet story. Before we rescued our two dogs we had a cat named Hershey Kisses Boyce (Kissy for short). We loved her dearly and missed her terribly when she passed. Kissy was half siamese and half calico with beautiful markings. She had a black marking on her nose in the shape of a Hershey Kiss, thus the name. I hope you have many happy years with Boogie. A hoe isn't a hoe without a pet. I love your story. I had a dalmation lab mix Diggity, that we always swore had a Speedo. It was a perfect black splotch that went around his hip and tail and looked like he was really wearing a Speedo. Also, I foster "TLTK" kittens from our shelter in Fort Worth. That means "Too Little to Keep", and they are sent up the hill to be euthanized unless a foster is available. So I get 'under 2 LB' kittens and feed them and love them until they are 2 LB's and adoptable, then they are safe when they are returned to find their forever homes. So thank you for taking one off the streets, healing and neutering him and most of all, keeping and loving and spoiling him. That's one more with a happy ending. Thank you very much for for taking care of him. I believe you will be blessed in the future for your kindness.